Plot summary: Lili eats all sorts of food which she enjoys. Even if she likes her food, she drops some on the floor for her dog. But when having dessert, she does not want to share with her dog. Lili feels full and satisfied from all the nice food, but the dog is a bit grumpy because it did not get any dessert. Attributes: Mirror – Lili looks at herself in the mirror. She eats broccoli and adorns herself with the food. She also throws food around and is quite wild while she is eating. She stands up in her chair and throws food around. She teases her dog. Thus Lili is quite a wild girl who likes to throw food around, eating in an untraditional way for a girl compared to a traditional view of gender. But she also looks at herself in the mirror, just like other young girls often would do. 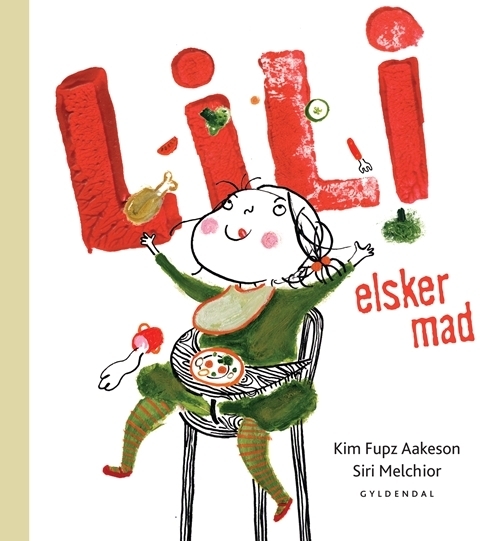 In this book Lili shows that there are many ways of being a girl. One can be a girl and still be wild and throw food around. But she is also in contact with her feminine side as she likes to look at herself in the mirror and adorns herself.